Headed to Celebration VI this week? 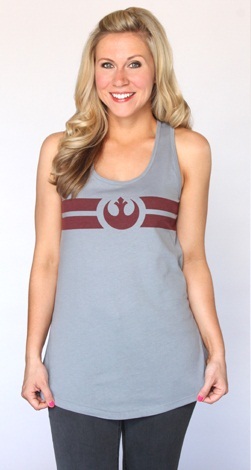 Then you wont want to miss out on new gear and exclusives from Her Universe! Her Universe has new merchandise and con exclusives available at CVI in Florida this weekend. The new merchandise that will be available at the con and on the website are these two simple but stylish racer back tanks featuring the Rebel and Imperial logos. 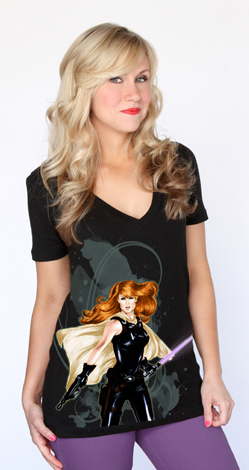 The must have exclusive that will be available at Celebration is this stunning top featuring the beautiful and powerful Mara Jade. It’s a limited run of 300 shirts, so this better be the first thing you run to buy when you’re at the con! Also available as a con exclusive is the exclusive they sold out of at Comic Con – this Sterling Silver plated R2-D2 charm. Don’t miss out on a second chance to own this adorable piece. Like the Mara Jade exclusive, only 300 of these will be sold at Celebration. Can’t make it to Celebration? Don’t worry! These exclusives will be available online at 10am on August 23rd. But you need to be quick, only 50 of each exclusive will be sold online! I purchased the Mara Jade top! It’s stunning in person!